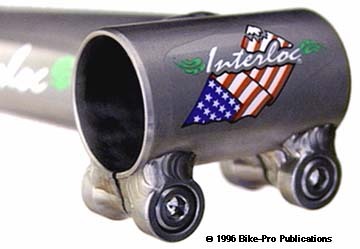 Interloc Racing Designs has always been at the front of new mountain bike concepts. They make a lightweight 4130 Cro-moly mountain stem that has a different quill/expander system. 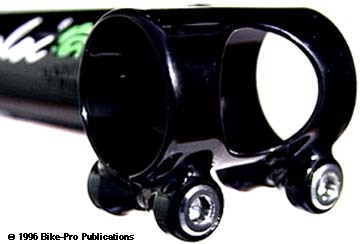 The quill is made up of a double expander system, the upper expander, using a cap piece cut as a wedge holds the stem extension and binder assembly tightly in place, while the lower one holds the stem system into the fork steerer tube. We'll discuss this in more depth. A lightweight, thin-wall, cro-moly vertical tube 1 5/8" tall, with 3/4" holes drilled through both sides, is TIG welded to the deeply miter cut extension tube. The extension tube is round throughout, and is welded, to the sides of the 1 5/8" vertical tube. The binder is made of thin walled cro-moly tube with a 7/8" hole drilled through both sides. All these holes reduce the overall weight of the stem, and assist in relieving heat and stress build-up at time of welding. The handlebar binder system features a double binder bolt assembly. The binder fittings are made of machined steel rod, turned on a lathe to reduce it's diameter in the middle, then drilled and tapped to fit somewhat smaller bolts than others use. The binder bolts are made of Titanium, with a 4mm allen head, is 18mm long, having a 5mm by .8mm thread pitch, and weighs 2.5 grams each. The binder fittings are TIG welded to the bottom of the binder tube, then the entire tube is sawn through at the bottom horizontally to make the cinch closing mechanism. The cap piece that slides into the steel vertical tube is machined from solid aluminum rod, that is turned on a lathe to shape and cut to it's 1 11/16" length. The solid piece is bored, drilled and tapped for the expander bolt, from the top. The piece is then cut diagonally, lengthwise to create two wedges from the same piece. Separately, a piece of aluminum tubing, that fits into the vertical tube, is cut at both ends with the same wedge angle running parallel to each other at 2 3/4" distance. The upper, (cap), wedge piece rests on top of the tube, while the lower wedge piece fits at the bottom. The expander passes through and sits into the cap wedge, then threads into the lower wedge. As you tighten the bolt both wedges compress, the upper against the vertical tube, the lower into the steerer tube, tightening the stem fully in place. The expander bolt is made of Titanium, is 120mm long, with a 8mm by 1.25mm thread pitch. The expander bolt has a 6mm hex head fitting, and weighs 25 grams. Brake cable routing (if needed) is accomplished through the use of a cable hanger off the headset, (found separately in our brake section). The steel part of the stem is powder coated, (electrostatic), in a high gloss Black. Overall this quite a different design. The IRD Mountain fits the standard 25.4mm diameter mountain handlebar, or can be used with a handlebar shim if you use the 22.2mm non-bulged variety. IRD's stem is made for the 1" steerer tube only, however IRD makes a split tube aluminum, Stem Shim/adapter so their stem, (or anyone else's), can be used in a 1 1/8" or 1 1/4" size fork. The weight of the Type 6 (Rickey Racer) stem is 255 grams. Very limited availablity. 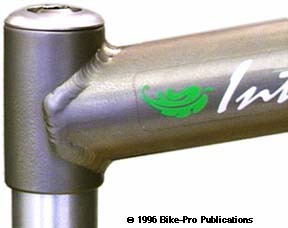 IRD also has a Titanium version of their mountain stem. On the Ti version everything that was made of made of Cro-moly steel is now made of Ti 6Al-4V material. It has exactly the same styling in the fittings, their placement, and weld techniques. The two things it doesn't have that the steel model has is the 19mm diameter hole at the rear of the quill loacated vertical tube and the 22mm diameter hole through the front of the binder tube. The holes through the vertical tube and the binder tube to relieve heat and pressure during welding are still there on the Ti model. The Ti model uses exactly the same Ti binder bolts, and expander bolt with the double wedge expansion quill. Mkaing it work with an oversized headset is still avhieved by using an IRD Stem Shim to enhance the diameter of the quill. It's made in the same lengths and rises referred to as types, listed above in the steel model. The weight of the Type 6 (Rickey Racer) Ti mountain stem is 223.5 grams.